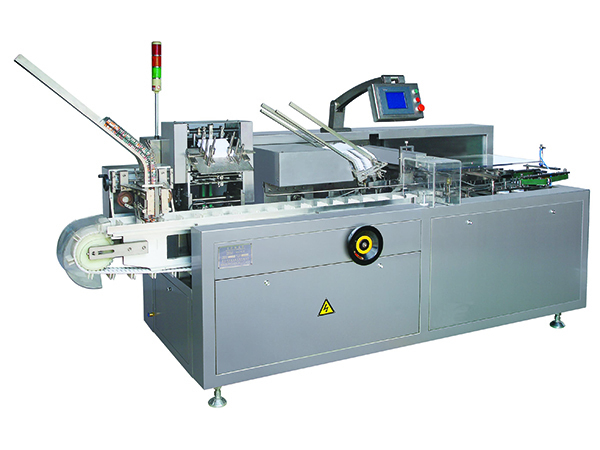 The automatic cartoning machine is used to insert blisters, bottles, vials, tube, ointment, sachets, injections, cosmetic, condoms, ampoules, plow-wrapped products, soap components, automotive parts, hardware, frozen food, milk powder bag, cereal bag, pharmaceutical products and just about any other product into a range of different carton types. It utilizes an advanced technology that has combined pneumatic, photoelectric and mechanical technologies, and completes operation using a series of photoelectric controllers to ensure machine stability and packing quality. It is capable of 1 to 4 folds leaflet automatic folding, carton vacuum extraction and opening, placing products and leaflet inside, printing batch numbers, and sealing or hot melt coating. It could be used individually, or linked to a filing machine, blister packing machine, shrink machine, 3D packaging machine and other equipment in order to form a production chain. 2. Easy human to machine operation interface. 3. Automatic display for any problems, speed and counting of finished products. 5. No products not suction leaflet, no leaflet not suction carton. 6. An automatic detection and rejection device is used to sort through non-qualified blister products and leaflets. 8. Stable performance, operation is easy.